Hampton Inn Galveston: The Attractive Texas Hotel. 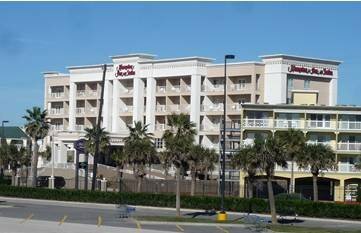 Hampton Inn Galveston is the closest of Galveston Texas hotels near Walmart mall and the Galveston seawall. The Hampton Inn is a 5 floor hotel with 105 rooms. It's about 400 meters from the beach. The position of the hotel does not guarantee a great gulf view. Beside that, the location is lively because of the mall activity. It provides a "feel at home" atmosphere. A perfect place for shoppers and those who want easy access to a mall. Access to restaurants on the seawall like Golden Corrals Buffet and Lubys are efficient. The hotels position is perfect for a quick tour of attraction sites or a fast drive to the port of Galveston for a cruise. Find out more about this hotel. It is recommended for those who love to feel at home in a hotel. The Average Rate for the hotel is $149.00 in summer time. Take I-45 South to Galveston. Take 61st Street Exit and turn right at the light to Seawall Blvd. At the next light make a right on Central City Blvd. The hotel is on the right.